As 2019 comes into view, I return to my annual challenge, the curiosity that I call my ‘Smartphone of the Year’ here on Forbes. With manufacturers looking to deliver similar functionality and specifications to consumers, once more I’m using personal judgement rather than benchmarking to pick a winner. There’s no empirical way to measure this, and that means the process is more about looking at a list of this years phones; thinking about how I feel about the handsets, the manufacturer, and their day-to-day usage; and deciding which handset rises to the challenge, says something about the manufacturer behind it, and has made a lasting impact on the industry in the last twelve months. But before I name my personal winner, I want to talk about some of the notable smartphones that didn’t reach the top spot. The smartphone world is starting to feel pretty homogenized. As expected Apple’s adoption of the notch in 2017’s iPhone X following its appearance in a number of Android handsets legitimized the rush towards ‘all-screen no-bezel’ as a design principle. Few manufacturers have managed to get to 100% screen and no bezel yet (at least not without redefining what the word ‘edge’ means). One who did was the London-based startup Planet Computers. Following a successful round for crowd funding, it released the Gemini PDA. Out the packaging you get an aluminium slab with two black endplates. Thanks to the ‘action’ button on the edge you can pick up incoming calls, and also start calls through voice commands, but you’ll also spot a thin line between the front and back cases. Crack this open and the Gemini reveals a full-action qwerty keyboard paired up with a wide touchscreen. 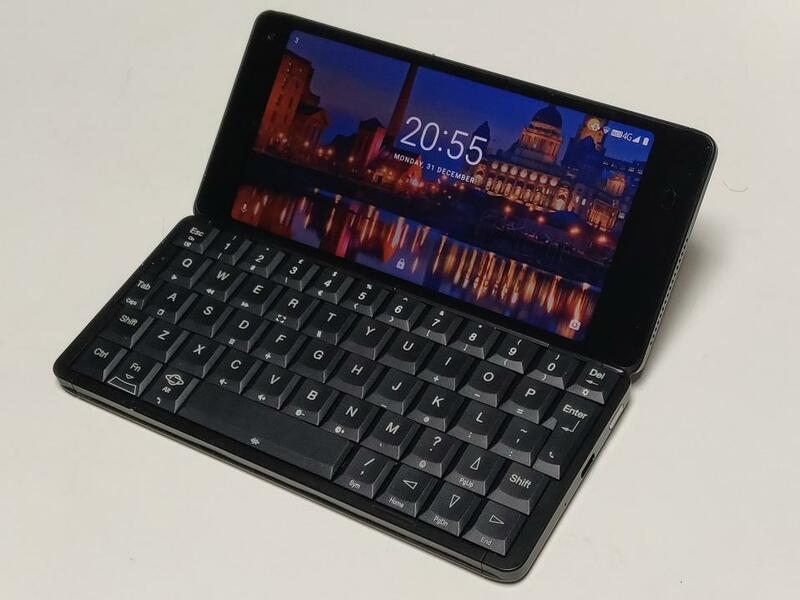 It’s a smartphone (with 4G and Wifi connectivity options); It’s a tiny laptop running Android (flash able to Debian Linux, Sailfish OS, Kali, and more); it’s a productivity tool second to none; and yes, you can write out articles and blog posts and newsletters on the keyboard without getting cramp. It might not look curiously small to American eyes, but to European and UK eyes who remember the days of Psion and the mighty Series 5 and Series 5MX PDAs from the turn of the century, and the place of the Gemini becomes clear… it’s a genuine Android PDA. Yes the PDA form factor has limited appeal, and its never going to be a mainstream device. But it delivers on a promise that is very close to the heart of the british mobile tech industry. The Gemini has some rough edges, the software is still not perfect for the clamshell device, but it works well, has a vision that stands out, and is proving to be a success. I’m a convert to the Gemini and backed the project. With the second device (the Cosmo) is on its way and set for a 2019 launch, I can’t wait to see what Planet Computers does next. The Gemini is a stand out device in my 2018 and deserves an honourable mention. Let’s go from the small company with limited resources to the elephant in the calendar. Apple started the year with the iPhone X not performing as hoped. Orders to parts suppliers were cut, and the next-generation handset failed to increase sales of the iOS powered smartphones. With the indications that Apple expected a rise in handset sales, the iPhone X, while a technological step forward, failed to increase Apple’s sales. Notably, the iPhone X illustrated a decision to increase the margins and revenue by raising the price of the smartphone. The value proposition of the iPhone brand getting harder to justify with Android headsets of comparable features were cheaper, and Android handsets of comparable price packed in more technology and features. Arguably the iPhone X took Apple down the wrong development and distribution path. So the natural thing in 2018 was to double down. The iPhone X design was placed into three handsets – the iPhone XS and iPhone XS Max were natural successors (that raised the price), but it was the iPhone XR that felt like Tim Cook going ‘on tilt’ with the decisions behind the iPhone X. The iPhone XR had a higher price than the iPhone 8 and 8 Plus it was replacing. The iPhone XR a similar feature set to the XS and XS Max but with a weaker screen and lower specced camera. But the evidence around the iPhone XR suggests that Apple has cut back on supply orders, is offering better terms to networks so subsidies can be raised, and is advertising significant discounts (via trade in). The iPhone XR may be the best-selling iPhone, but compared to the competition from Android the 2018 iPhone family may be facing a perilous drop in sales… and if the new strategy is all about extracting as much revenue from ‘software and ancillary services’ then the last thing you want is a smaller user base. The iPhone XR typifies Apple’s year. It’s very shiny, it appeals to the core audience, but the public are starting to look elsewhere. Tim Cook’s Apple is no longer perceived to be in the driving seat. The iPhone XR certainly tells a story of 2018, but it’s not the smartphone of the year. Rather than push too many changes on its user base, Samsung offered more of the same to its user based with the Galaxy S9 and Galaxy S9 Plus. Effectively it said ‘same again, but with a little bit of an improvement in each area’. Crucially Samsung made no bones about this. Yes it talked about where there were advances (notably in fast charging, the camera, stereo speakers, and the sensible repositioning of the fingerprint scanner). it still had key features such as the curved edges of the infinity screen, the extra-long aspect ratio of the screen, and Samsung’s continued push of the AI powered Bixby personal assistant via the dedicated hardware button. What the S9 or the S9 Plus didn’t have was a little sprinkle of glitter. There was no wow. Everything was predictable, reliable, and did the job. A workhorse smartphone that again met expectation, but unless you needed those few percentage points of capability, the Galaxy S8 was still a valid choice for many. The Galaxy S9 was South Korean table stakes – we’re still in the high-end smartphone game, but we’re not showing our hand during 2018. The Galaxy S10 is expected to bring a little less predictability and more visible changes to the Galaxy S family when it launches in early 2019. Google’s third Pixel iteration was a curious one. It felt like Mountain View’s focus was on improving the photos and videos created by the handset, and it achieved that. But as a phone the Pixel 3 and Pixel 3 XL handsets were found to be a little lacking. The large bezels of the Pixel 3 (compared to the competition) destroyed any attempt at pushing fashion and design, while the notch on the Pixel 3 XL was one of the more awkward versions of notch designs during 2018. It also skimped on some of the core specifications – with just 4 GB of memory the handset does not feel very future proof. The strength that it had in software will shortly be available to every Android manufacturer. If you want to be ‘first’ with the Android operating system, or photography is the one key feature you must have, then the Pixel family is your best choice. But there are better options out there for the general consumer.